This entry was posted in Pixel Scroll and tagged Abigail Nussbaum, Amal El-Mohtar, Annalee Newitz, Ashley Pollard, Boris Karloff, Doctor Who, Galactic Journey, Harlan Ellison, James Cameron, Joseph Brassey, June Foray, Leonard Maltin, Mark Evanier, Punisher, Ray Bradbury, Rick Moen, Stranger Things, SyFy, The Terminator, Tom Baker, William Shatner, Wonder Woman by Mike Glyer. Bookmark the permalink. And Annalee Newitz’ Autonomous has go to the top of my To Read list. News of the weird: Hubble has identified an object in the asteroid belt as a binary asteroid…with comet-like features. It apparently split in two about 5000 years ago. SAN DIEGO — Southern California is battling an outbreak of hepatitis A, which attacks the liver and is highly contagious. San Diego has had more than 400 cases and 16 deaths. Lines are long and constant at pop-up clinics in the area, where hundreds of people waited to get free hepatitis A vaccines. City workers have been out in full force, bleaching down sidewalks and benches. “This outbreak could last for at least another six months,” said Dr. Nick Yphantides, who is San Diego’s chief medical officer. There’s a desperate race against time to stop the hepatitis A virus from spreading, especially among the area’s homeless and drug users. I thought this was interesting, based on the conversation the other day from a puppy yapping at Ursula LeGuin and her projections of diseases. 14) Everytime I think twitter is the worst, something shows me twitter is the best. If anyone else would like to be as freaked out by “Eat the ice cream” as I am, click on the link in (6) to the Adweek article on Stranger Things, and look at one of the other articles, on Halo Top Ice Cream. Play the video. Eat the ice cream. Congratulations young Panda, but that is but the first of the many challenges you must face. Only the truly enlightened can attain the coveted fifth. 3) Dang. How is his book going to live up to that? 12) On the other hand, seeing Bob Kane next to Jack Kirby is a “which of these things does not belong” moment. And Siegel and Schuster get one joint entry? 3) I have read Skyfarer. It is indeed a lot of fun. And indeed, judging from the book, definitely NOT Puppy code. Technically speaking filming of Shada was complete, what was lost was most of the studio time for interior scenes and the post-production time. Christmas was coming and plans for the Moscow Olympics were beginning to take up resources. Standard procedure then was that studio work was all electronic, outside work was shot on 16mm film. Edited film sequences would then be transferred to tape for the final edit along with the studio recordings. Being lost is the best thing to happen to Shada. If it had been completed, it would have been a so-so story. Now, we’ve gotten a VHS reconstruction (where Tom narrates the missing sequences), an animated webcast starring Paul McGann, a deluxe hardcover novelization by Gareth Roberts (with an audio reading by Lalla Ward and John Leeson), and now this. Probably something else I’m forgetting. @Steve Mollmann Probably something else I’m forgetting. Audience participation showings with chant-along narration in my university SF Soc, back in the day. Although I’m not entirely sure that was a positive. Get Andrew Lloyd Webber on the phone, stat! 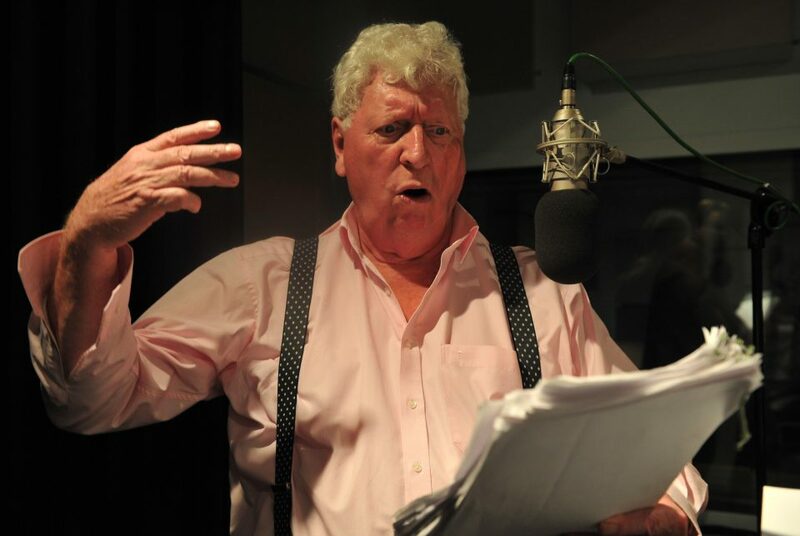 (1) Tom Baker has been playing the Doctor for the last six years in productions for Big Finish. Reading: I finished K.J. Parker’s The Company, which I quite enjoyed, read Lord Dunsany’s Book of Wonder, which was a very short collection containing a number of his best stories (The Hoard of the Gibbelins, e.g. ), and am now about 1/4 of the way through Guy Gavriel Kay’s Children of Earth and Sky and wishing I had time to just kind of sit down and inhale it wholesale. Only one episode of OUT OF THIS WORLD survives whole, that being “The Little Lost Robot”, from an Isaac Asimov story. Another “thank you BBC” story. I’m familiar with Leonard Maltin, the shill for Disney and the guy who hires other people to write reviews under his name.. Are you sure the for real Leonard Maltin.wrote this? There’s an arguable typo in the title: Bester spelled teleportation “jaunte” (possibly to make clear that this was no ordinary jaunt). @6: 10/10 for style — and that much also for good thinking. @7: the quoted opening isn’t quite fair — we don’t know much about reactions after she has saved the world — but rest is wonderful snark. I wonder whether Jenkins and the writers deliberately gave us stereotypes extreme enough to choke on, since they’re in period for this piece. @12: that’s quite a list, although with the usual nits. (e.g., L’Engle used folded space but didn’t originate it — that goes back at least to Have Spacesuit, Will Travel, which probably influenced at least as many SF writers; I don’t think “tesseract” (which she … repurposed …) became widely used as a term.) The pic opposite Carrie Fisher’s writeup is a role I don’t know; there are several possibles in IMDB but nothing conclusive. Can anyone identify? @ Robert Whitaker Sirignano. Except in this case the culprit was ITV. I still remember the boot crushing the tiny spaceship at the end of “Pictures Don’t Lie” and Dinsdale Landen landing the starship in “Target Generation”. Enough to help turn a 12 year old into an SF fan. Seems to me that Brassy has set up a false dichotomy rooted in feelings similar to those of my long-ago students. If I wouldnt have planned to watch the punisher before, I would now. Putting One as the score of the trailer was genius. 12) @Chip Hitchcock: I think Heinlein first used it in Starman Jones. I’m not sure if that’s the first use or not…wait. He used it in “…And He Built A Crooked House”, via a tesseract. That’s 1941. So there’s one mark in the sand. Not news, more appropriate to say it’s olds seeing as it’s from August 27th, but I just did my quarterly google for “Graydon Saunders” (I really need to find an RSS aggregator I like and make things easier), and saw that he’s nearly done with the next in the Commonweal series, has what sounds like a very long non-Commonweal fantasy novel near publication, and has a horror novel in the works (set in the world of the Commonweal, but not from the PoV of any Commonweal characters). The horror novel sounds particularly intriguing, seeing as the world of the Commonweal is basically a horror world, but the people of the Commonweal are basically simultaneously egalitarian and salt-of-the-earth types. Sadly, I came to a slow halt less than a quarter through Safely You Deliver (book 3). My problem was a combination of looong novel, lots of Hugo reading to do, a gigantic, always-beckoning Mt. Tsundoku, and that the plot felt like it was repeating itself or A Succession of Bad Days at times. This news raises Safely You Deliver up a few notches in my TBR list. EDIT: TBC list? Slate‘s Marissa Martinelli on how Star Wars and Star Trek maintain continuity. @John A, thanks for that, a surprisingly good article from a mainstream news source on a nerdy topic. But maybe the point of it is that nerdy canon-keeping is mainstream now! Chip Hitchcock: The pic opposite Carrie Fisher’s writeup is a role I don’t know; there are several possibles in IMDB but nothing conclusive. Can anyone identify? It’s from one of Dirck Halstead’s photo essays in LIFE magazine; so from a photo shoot, rather than a film. Encoding glitch? “doppelga?nger” has a ? in it. The page says it’s using UTF-8. @Jamoche: it’s a-umlaut (one character) in the original; possibly the original did ‘a’ followed by no-space (compounding?) umlaut (I \think/ Unicode does that), which got munged in cut-and-paste, rather than the single-character a+umlaut which normally carries. @Chip HItchcock: I’m pretty sure Heinlein only uses tesseract in “…And He Built A Crooked House”. In Starman Jones, Max uses a scarf to show how instantaneous travel between two points works by folding the cloth. I’m almost certain he doesn’t mention tesseracts. Kathodus, regarding RSS readers, if you were a fan of the old Google Reader, I’ve found “Inoreader” to be roughly similar in form and function (I remember flipping between Inoreader & The Old Reader and eventually deciding on Inoreader). Sites like Feedly were too flashy for me. One is the loniest pixel. Peer: One is the loniest pixel. Might need another letter there. “Looniest” works for me, but we all know how good my copyediting is. @David H – Thanks! I hate Feedly! I used it for several months, but it seemed to be a huge resource hog, and the interface slowly became more and more crappy. I’m not sure what exactly they were aiming for, but it was exactly what I don’t want. I’ll check out Inoreader. @Arkansawyer: interesting — L’Engle uses the same folded-cloth demo, although with a skirt rather than a scarf. (IIRC the original actually had line drawings illustrating an ant’s progress, but they’re not in my cheap pb.) I wonder whether they were both repeating an earlier analogy (e.g., did Gamow use this in One, Two, Three, … Infinity (1947)? ); I don’t think of L’Engle as having had enough background in genre to have read a 2nd-rate Heinlein (and at that a YA published when she was ~35), but I haven’t seen any reliable discussion about why she turned to genre after a series of mimetic novels. @JJ: thanks for IDing that. I wonder what the setup was — but given that it was for a photo essay, it may have been about the essayist rather than the subject. @kathodus, Yay, three new Graydon Saunders novels. Great news. I will certainly buy them all, although reading 320 k words long novel written in Graydon’s style surely seems daunting task. reading 320 k words long novel written in Graydon’s style surely seems daunting task. Yes. I love his style and voice, but the reading is not quick or easy. @Chip Hitchcock: I would take issue with Starman Jones being “2nd-rate Heinlein”. Thanks for the comments about RSS readers. I tried to find one when Google’s Reader went under and couldn’t find one I liked enough. The Old Reader is a perfect fit! I’m glad you mentioned it.